The key to the new design relies on something that may or may not be abundant on Mars: underground water or ice. 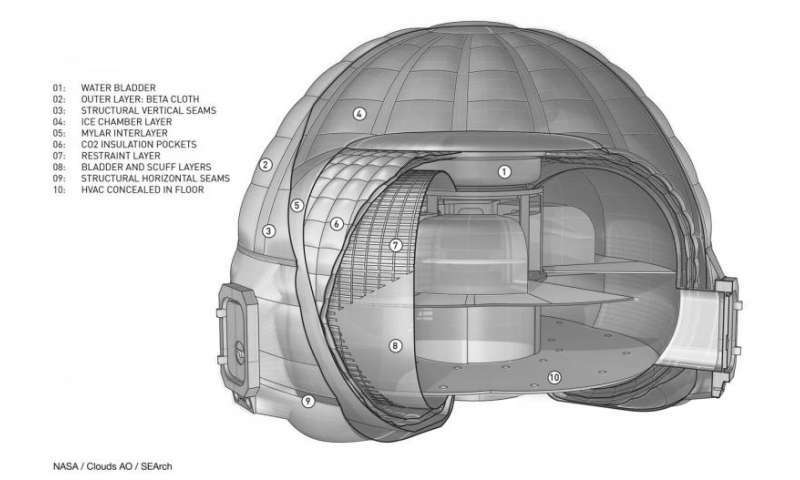 The "Mars Ice Home" is a large inflatable dome that is surrounded by a shell of water ice. 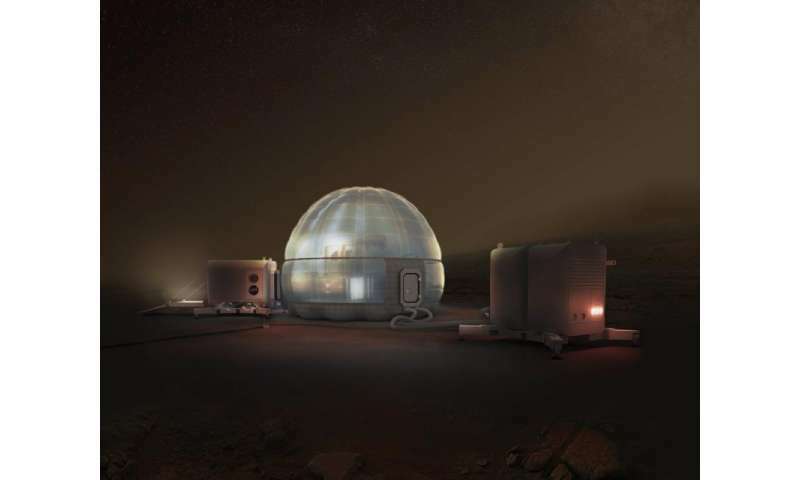 NASA said the design is just one of many potential concepts for creating a sustainable home for future Martian explorers. 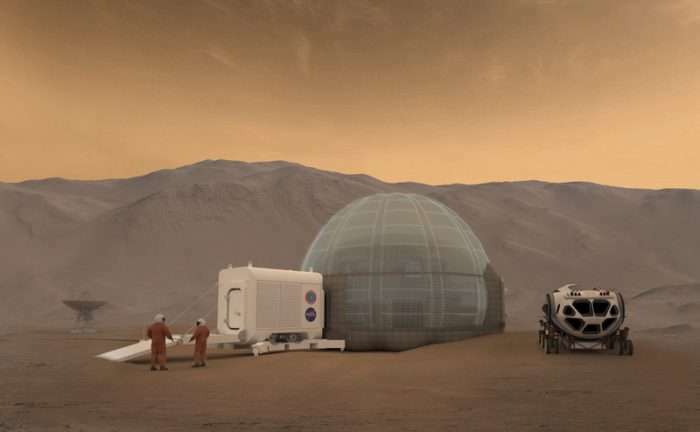 The idea came from a team at NASA's Langley Research Center that started with the concept of using resources on Mars to help build a habitat that could effectively protect humans from the elements on the Red Planet's surface, including high-energy radiation. Langley senior systems engineer Kevin Vipavetz who facilitated the design session said the team assessed "many crazy, out of the box ideas and finally converged on the current Ice Home design, which provides a sound engineering solution," he said. 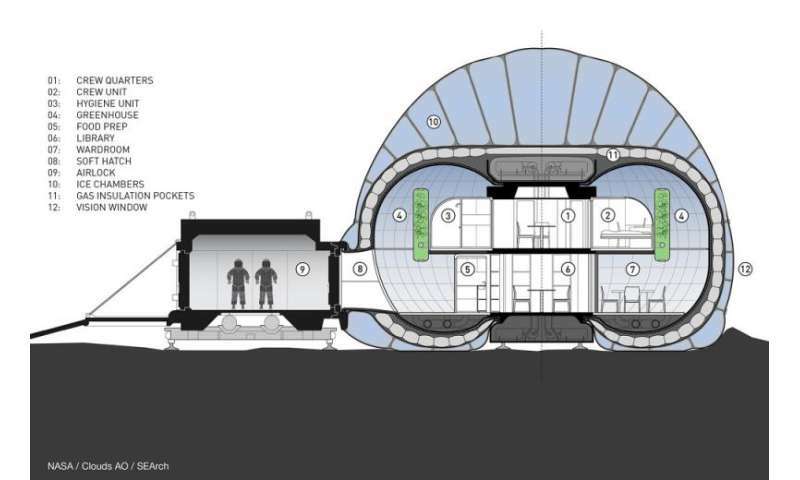 The advantages of the Mars Ice Home is that the shell is lightweight and can be transported and deployed with simple robotics, then filled with water before the crew arrives. The ice will protect astronauts from radiation and will provide a safe place to call home, NASA says. But the structure also serves as a storage tank for water, to be used either by the explorers or it could potentially be converted to rocket fuel for the proposed Mars Ascent Vehicle. Then the structure could be refilled for the next crew. Other concepts had astronauts living in caves, or underground, or in dark, heavily shielded habitats. The team said the Ice Home concept balances the need to provide protection from radiation, without the drawbacks of an underground habitat. The design maximizes the thickness of ice above the crew quarters to reduce radiation exposure while also still allowing light to pass through ice and surrounding materials. "All of the materials we've selected are translucent, so some outside daylight can pass through and make it feel like you're in a home and not a cave," said Kevin Kempton, also part of the Langley team. One key constraint is the amount of water that can be reasonably extracted from Mars. Experts who develop systems for extracting resources on Mars indicated that it would be possible to fill the habitat at a rate of one cubic meter, or 35.3 cubic feet, per day. This rate would allow the Ice Home design to be completely filled in 400 days, so the habitat would need to be constructed robotically well before the crew arrives. The design could be scaled up if water could be extracted at higher rates. The team wanted to also include large areas for workspace so the crew didn't have to wear a pressure suit to do maintenance tasks such as working on robotic equipment. To manage temperatures inside the Ice Home, a layer of carbon dioxide gas—also available on Mars—would be used as in insulation between the living space and the thick shielding layer of ice. "The materials that make up the Ice Home will have to withstand many years of use in the harsh Martian environment, including ultraviolet radiation, charged-particle radiation, possibly some atomic oxygen, perchlorates, as well as dust storms – although not as fierce as in the movie 'The Martian'," said Langley researcher Sheila Ann Thibeault. "The key to the new design relies on something that may or may not be abundant on Mars: underground water or ice." An odd claim given that the biggest space story of the year was the discovery of a deposit of ice larger than New Mexico and comparable in volume to Lake Superior. It's interesting. But, sending humans to Mars is still mostly science fiction and a grand waste of resources for what is likely to have a tragic outcome. Instead of investing time and money into a big Mars gimmick, put it into developing machines that can do all of the exploring and sampling at a far lower cost and risk. What we need is a sturdy machine that can handle multiple environments so that copies of it can be sent to other places we want to explore like Europa and some of the planatoids in the asteroid belt. If all of the resources are spent on proving we can put humans on another planet, we will miss out on a lot of real science opportunities. What about outside the dome? Radiation and low gravity still hurts humans. "make it feel like you're in a home and not a cave"
-My home is not made of translucent materials. It has windows. All these compromises to make one structure do everything might not be a very good idea. Fot instance if the ice thawed and refroze periodically this might weaken joints which would endanger the primary crew containment in this configuration. And if for some reason they realized that the water would have to be stored separate then the whole mission would be jeopardized. The tragedy would be if we failed to spread ourselves around the system and a civilization-ending event occurred here on earth. Extinction is the greatest tragedy of all. An awwwwfull lot of h-h-heavvy water over the heads of the hapless soon to be crushed crew in case of a blowout. Like the underground habitat better. One could even imitate the ancient Turks of Cappadocia and built inside a mountain or a ring crater and make rooms with view windows. However this would come with a caveat that automatic doors would isolate any section that suffered a decompression...no exceptions. Besides if one wanted to expand the already sealed area, one could work in comfort hollowing out more underground space. Water may be freely available down there too in underground strata. "An awwwwfull lot of h-h-heavvy water over the heads." 62% less heavy than you think. Hydrogen-rich materials tend to work best for radiation shielding because hydrogen nuclei (protons) do not split apart and cause secondary radiation. Water is probably the most abundant hydrogen rich material likely to be available on Mars. This idea has promise in theory, but it has to be robust enough in the actual implementation. In addition to all the other problems of surviving on Mars, I would not want to worry about my only shelter melting. My gut tells me we should build a structure that can standup to ANYTHING Mars can throw at us with no worries. Let's over-engineer strength and durability so the thing will still be standing a century for now. Failure is not an option. The shelter on Mars will probably be the only safe haven for the astronauts for ~2 years. Mankind's best hope for surviving on Mars at this time. Would you gamble everything on this design? I doubt it. It should be a fortress and source of confidence for everyone, both on Mars and watching here at home. Make it strong as we can for the weight allowed. I'm sorry but I've got to ask... why would you think the designers wouldn't be doing just this? You're just nervous because of the scene where mark Watney got blowed into the dust when the airlock seam unzipped. And the potatoes all froze. We could be transporting kilotons of preengineered and overengineered materiel to mars right now. We have all the tech we need except for an adequate power source. Nuclear could serve but we currently don't have the will or the impetus. We also have a limited stockpile of fissiles and can't afford to expend it prematurely. A crisis could however be all we need to perform another exodus. But a new power source could make it happen quickly and easily. And this could be the year that one emerges. Not in one chunk. While there may be that much water on Mars it's a bit like mining rare earth metals on Earth. There's a considerable amount of it in total, but not much in any particular volume of soil. I would not want to worry about my only shelter melting. At Martian temperatures I don't think that's something you'd have to worry about. My gut tells me we should build a structure that can standup to ANYTHING Mars can throw at us with no worries. ..which isn't much. At only 1% of atmospheric density of Earth even dust 'storms' carry next to no force. The one thing that Mars could throw at us would be meteor strikes (low atmospheric density makes for a bad meteor shield). However, no amount of overengineering - save for going way underground - is going to stand up to that. Well one big positive from this tremendous waste of funds is that it keep NASA busy and gives it less time and resources to tamper with the climate data. Aa enjoys guessing. How come? "Recent evidence has led many planetary scientists to believe that water ice still exists as glaciers across much of the Martian mid- and high latitudes, protected from sublimation by thin coverings of insulating rock and/or dust... it has been confirmed that lobate debris aprons contain almost pure ice that is covered with a layer of rocks." -only one example of pure ice deposits. Millions of tons in specific areas. "Surface temperatures may reach a high of about 20 °C (293 K; 68 °F) at noon"
The main problem with this kind of shelter is that it limits you to putting your base somewhere that has an *excess* of water. If you build in one of Mars' many lava tubes, you have a much wider area of the planet to choose from - and you don't need to tie up precious water. Before we put any boots on the ground on Mars, I think we should establish an orbital presence in an ISS-type space station. Then we could use remote-operated construction equipment to build our on-world habitats without unnecessarily exposing astronauts to the hazards of the Martian surface. This approach would be doubly advisable if DARPA can ever manage to develop a working "space elevator". I also think we should use the Moon as a "test run" for Mars, so we can work out the bugs while help is only days - rather than months - away. In the first year, we could have people on a Moon-orbiting station, while remotely constructing the lunar base. In the second year, we have people living on the Moon while the Mars station is en route. Year 3 would have occupation of the Mars station & construction of the Mars base and year 4 would see the Mars base occupied. Now that reality has struck and the AGW gravy train has derailed, NASA will need to find a new reason to deserve government funding. Thus, they produce articles like this. They really do need to find new projects that actually advance science enough to deserve funding. Then we could use remote-operated construction equipment to build our on-world habitats without unnecessarily exposing astronauts to the hazards of the Martian surface. In what regard do you think is the Martian surface more hazardous than a space station? There's pros and cons for this. For all intents and purposes the Moon is as far away as Mars (you're not going to stage a 'quick rescue' to the Moon any more than we are going to do so for Mars). A pro is that it's a bit cheaper to get to the Moon, but the most crucial technologies that need to be tested cannot be tested there (viz. : farming in Martian soil and water extraction/rocket fuel generation technologies). You mean now that Trump's oil tycoon buddies have free reign to trash the planet? That's all the more reason to fund NASA - so they can find us a way off this rock before it becomes unlivable. Planet-wide sandstorms hurling razor-sharp regolith at 60mph for one. More difficult evacuation in case of emergency for another. And then there's your garden-variety accidents - you can't fall down off a cliff or trip over a rock if you're working by ROV. For all intents and purposes the Moon is as far away as Mars (you're not going to stage a 'quick rescue' to the Moon any more than we are going to do so for Mars). It takes 3 days to get to the Moon. It takes at least 150 days (best case scenario) to get to Mars. If NASA were to keep a rescue vehicle stored in a hangar - so that they just had to wheel it to the launch pad, fuel it up & launch - rescuing Moon astronauts would conceivable be possible. Mars astronauts are undoubtedly on their own. antialias wrote: "For all intents and purposes the Moon is as far away as Mars (you're not going to stage a 'quick rescue' to the Moon any more than we are going to do so for Mars)." MadScientist72 Already contrasted trip times: 3 days vs 150 days (more likely 200+ days). There's also launch windows. Launch windows Earth to Mars open ever 2.14 years. Same for Mars to Earth launch windows. In contrast, lunar launch windows open constantly. "I'm sorry but I've got to ask... why would you think the designers wouldn't be doing just this? You're just nervous because of the scene where mark Watney got blowed into the dust when the airlock seam unzipped. And the potatoes all froze." Yes, I am confident the engineers WILL make the structure strong, and for very good reason. These missions are going to run around two years each on the surface of Mars, with the possibility of continual and unplanned emergency occupation going forward. If the primary structure on Mars has a serious design flaw, that might be the best way to kill the entire crew. So yes, with a nod to Mark Watney, oh my god am I thinking strong, strong, mighty GD strong. I wonder if portions of the ice closest to the inner structure could sublimate from heat passing through the inner layer and create high pressure pockets that could damage the inner layer. Continual cycles of sublimation and freezing could cause fatigue. "My gut tells me we should build a structure that can standup to ANYTHING Mars can throw at us with no worries. ..which isn't much." I disagree. The pressure differential between the Martian environment outside and Earth-like environment inside is huge and must be maintained for years. The huge day/night temperature swings could cause fatigue and other issues with uneven heating/cooling. 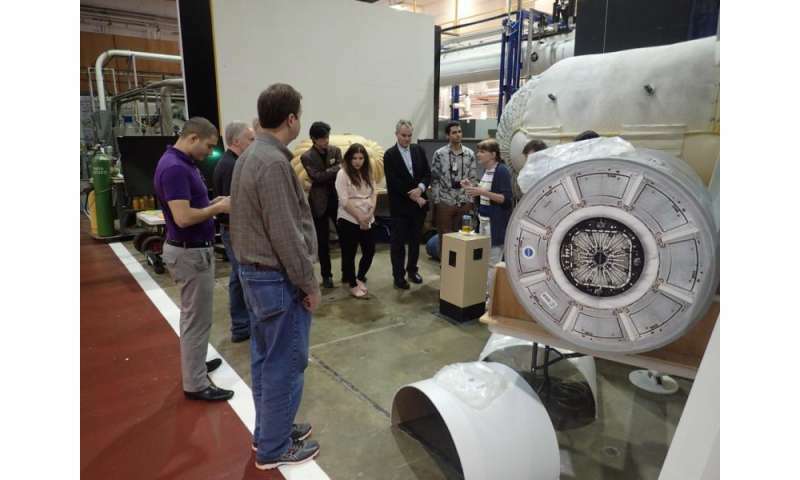 As I pointed out above, the primary Mars shelter may be the biggest mission risk of all, even more than the Mars lander, because it has to work continuously for many years. I am thinking the shelter should be separated and insulated from whatever Martian materials we want to use, kind of like a thermos. If you want ice above their heads, use a very strong alloy structure to hold it, with a separate structure of different materials as a back up. We are not sending our astronauts to die, we are sending them to boldly go where no one has gone before, and we want them back when they are done! The issue is more that you would have to have a ship on standby and prepped for rescue purposes. That's expensive hardware that is pretty much sitting around doing nothing. 3 days is also way too long in the event of a serious mishap. Serious mishaps in space aren't like Hollywood movies. Either you have ample time to fix/resupply or it's instant death. I disagree. The pressure differential between the Martian environment outside and Earth-like environment inside is huge and must be maintained for years. "We've been doing this with the ISS for decades. The temperature (and even the pressure) differentials for the ISS are more extreme than for anything on Mars"
None of those spacecraft used Martian water ice held against gravity above the astronauts' heads as a key component. AAP, I think your comments arise from scientist's perspective, i.e., it is possible. My comments arise from an engineer's perspective, i.e., I agree it is possible, but it is critical and complicated that we get this right so people don't die. Long-term, Zubrin is clearly right and the use of local materials is absolutely necessary, however, we still need to have a very cautious approach to protect our astronauts, especially at this early stage when there are little to no backups. This proposed design, while certainly clever, does not yet inspire complete confidence. Since we don't seem to be ready to develop a reusable, opposition-class spacecraft, the first Mars mission will be on the surface over a year. The issue is more that you would have to have a ship on standby and prepped for rescue purposes. That's expensive hardware that is pretty much sitting around doing nothing. Not really, since there would need to be regular resupply missions going there anyways. You could just have the vehicle on standby as a rescue vehicle until it's time for its milk run, at which time the one for the next mission takes its place. 3 days is also way too long in the event of a serious mishap. Serious mishaps in space aren't like Hollywood movies. Either you have ample time to fix/resupply or it's instant death. What constitutes "ample time" depends on the mishap. If the habitat blows a seal & starts venting atmosphere, then there's nothing a rescue mission could do. But if one of the astronauts suffers an injury or illness, 3 days (6 if a return trip is necessary) could be the difference between life and death.